Friday, March 21st: 6-9 p.m.
Saturday, March 22nd: 12-3 p.m.
Sunday, March 23rd: 12-3 p.m.
*I am also open by appointment if you are unable to make these hours. Coming up fast at ZIA Gallery: Two Must-See Exhibitions! 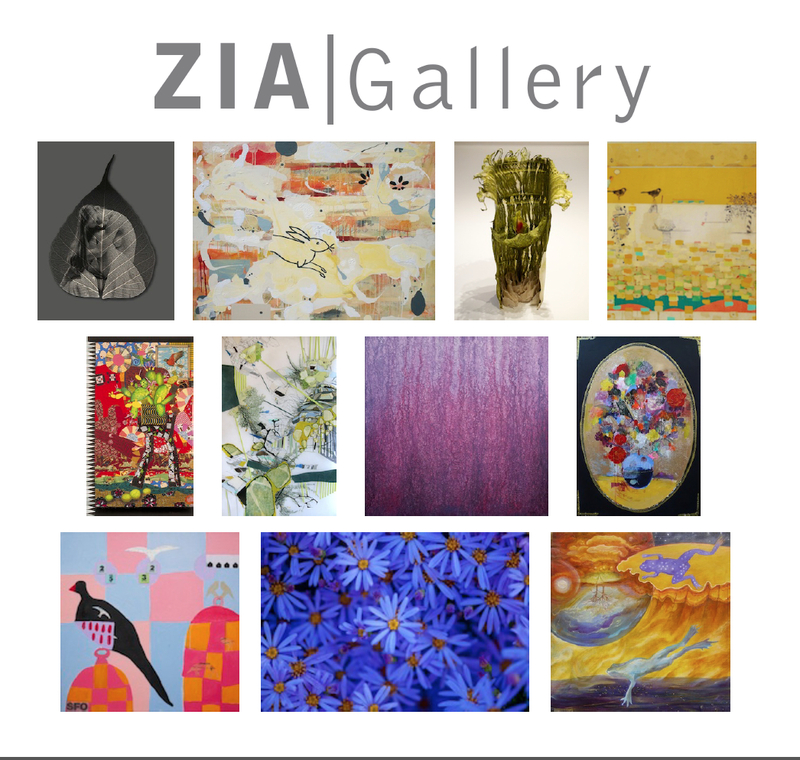 Expect an explosion of color and exuberance with ZIA Gallery’s next exhibition! To Summon Spring features a great line-up of Gallery Artists and Artworks – Mary Burke, Melissa Jay Craig, Michael Cutlip, Karina Hean, Charles Gniech, Anne Hughes, Ted Preuss, Jonathan Ricci, Fumiko Toda, John Vlahakis and Kathy Weaver. Opening Reception is next Saturday, February 22, 5:00 – 7:00pm at ZIA Gallery, 548 Chestnut St., Winnetka, IL 60093. The exhibition runs through March 15, 2014. Immediately following, ZIA Gallery presents another intriguing exhibition: Iceland Inspired. More and more artists are finding their way to Iceland and discovering the wonders of the land and its fascinating geotectonic geology. Photographer and environmentally aware John Vlahakis and mixed media painter Jonathan Ricci recently spent extended time in Iceland creating considerable bodies of work. Last summer, Ricci turned a two-month artist’s residency in Skagastrond into a productive period developing paintings infused with abstract references to land, maps and bird-life. Works conceived from that time will be on exhibit. John Vlahakis chose February as the month to compose remarkable images including a number of large-scale photographs. His work elicits frequent expressions of awe. Internationally acclaimed National Geographic photographer Bob Krist and mixed media painter Anne Hughes serve as bookends to the exhibition with a smaller amount of work equally inspired by time spent in Iceland. The exhibition opens March 22, 5 – 7pm and runs through April 26th, 2014. See how Iceland is influencing art in Iceland Inspired. The 9th Annual Lillstreet Student Member Show is a showcase of the diverse artist community studying at Lillstreet Art Center from Oct. 7th-Oct. 13th at Lillstreet Gallery. All items on view are available for sale. New pieces are added as others sell. To see the best selection, come early and come often. 10% of all sales benefit Artreach at Lillstreet. 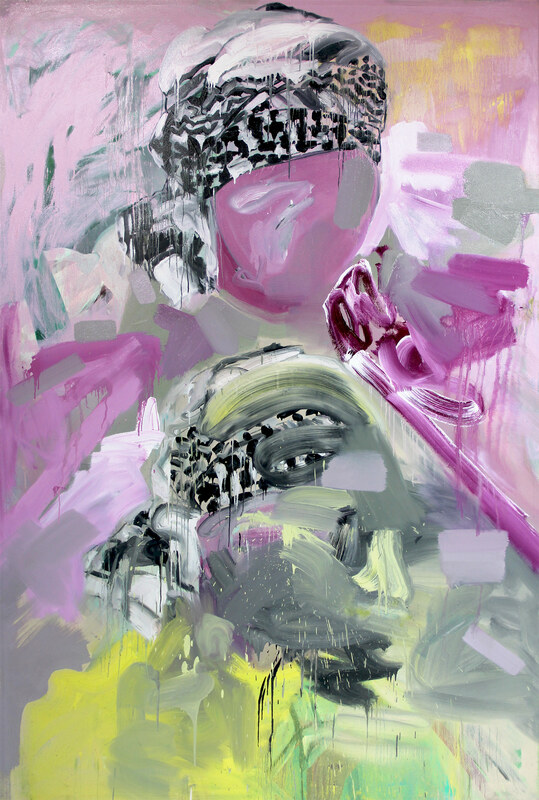 Chicago-based emerging artist, Jennifer Cronin will be exhibiting “Realities” at Elephant Room October 2nd through November 9th, as the city celebrates Chicago Artists Month. The opening reception will be on Friday, October 4th from 6:30 to 9pm. There will be a “Meet the Artist” event on Saturday, October 12th from 6pm to 9pm during the Greater South Loop Association’s Art Walk as well as an Artist Talk on Thursday, October 24th at 5pm. All events are free and open to the public. “Realities” is a body of work that explores the relationship between what is real and what is perceived. Through both oil paintings and drawings, Cronin demonstrates the mystery of the human mind and the complexity that lies beneath familiarity. 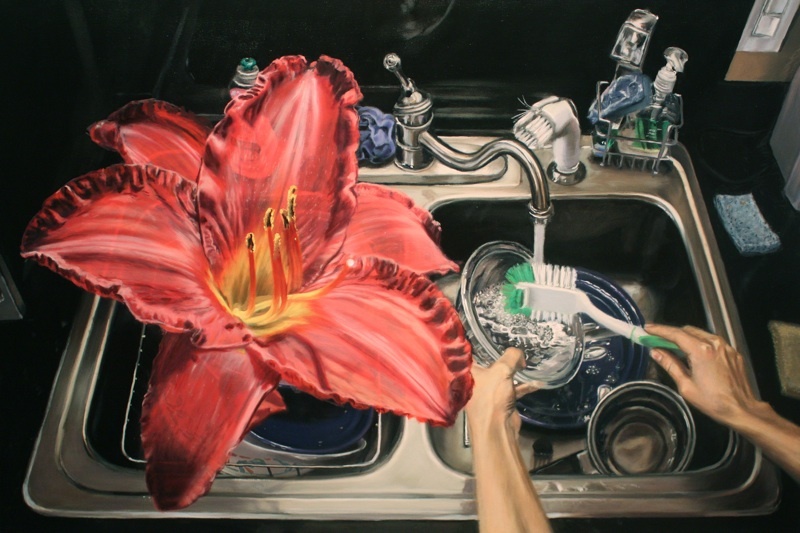 Cronin’s work can best be described as a psychological photo-realism. Her ability to paint humans and objects quite realistically while at the same time making the environment within the painting feel “other-wordly” is quite impressive. This theme remains a constant within most of Cronin’s work and continues to evolve as her body of work continues to grow. Jennifer Cronin was born and raised in Oak Lawn, Il. She attended the University of Illinois at Urbana-Champaign, where she earned a BFA in painting and art education, while also pursuing her interest in psychology. During this time, she developed an interest in psychological dramas that present themselves within domestic spaces. This interest eventually became the subject of her paintings. As the capstone of her education, she studied painting at Camberwell College of Art in London, completing her education in March of 2009. Since graduating, Cronin has exhibited in the Chicago area, nationally and internationally. She continues to paint in her studio at the Fine Arts Building in downtown Chicago. DreamBox Gallery will celebrate “In The Neighborhood” by opening its door to the community to experience the cultural link between artists and their creative currency: Word Image Idea. 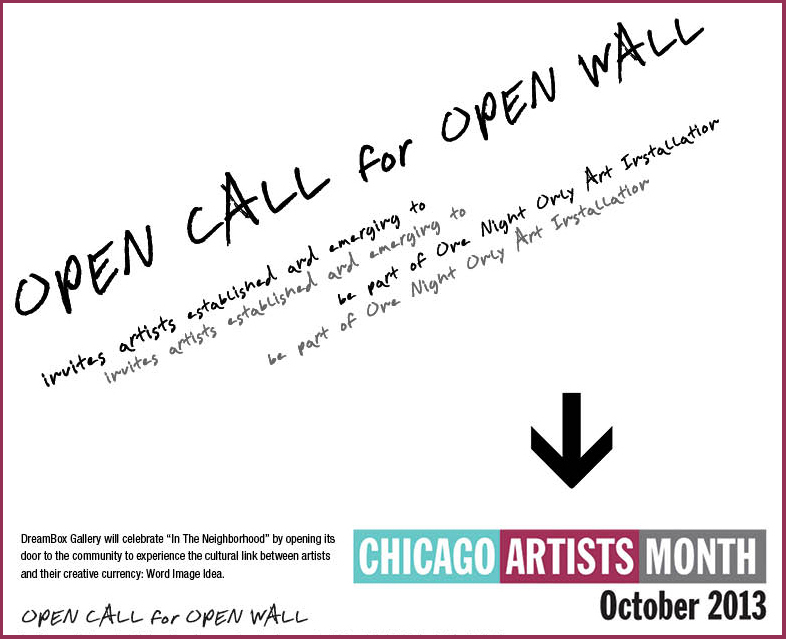 OPEN CALL for OPEN WALL invites artists established and emerging to be part of One Night Only Art Installation. Thursday, October 17, 2013 (between the hours of 3pm and 8pm) artists may place only one of the following: One painting, One drawing, One photograph, One sculpture, One poem or One installation on the wall. Curators Iwona Biedermann and Tom Robinson will welcome artists as long as space allows. Bring your own hammer and the label with your information. Create, inspire, and be inspired by Chicago artists becoming part of the creative, curatorial process. Friday, October 18, 2013 opening reception at 6 pm-10p.m. with special guests: spoken word artist Tracey King and music by JohnnyComesLate – TJSet, Tadek Majewski, Janusz Klonowski. This collaborative, multi-disciplinary project encourages the exchange between visual and performing artists. Saturday, October 19, 2013 from 1pm to 4pm, artists Agnieszka Podczaszy and Tom Robinson will present parents and children (ages 5-10) with a creative inspiration of how to make toys and sculptures from pieces of wood.